4RealSim welcomes you to attend a webinar introducing HyperSizer Pro. HyperSizer Pro is software for the aerospace industry. From preliminary optimization for weight reduction and manufacturability to final design certification, the software uses the same analysis methods from beginning to end of the project – avoiding unexpected negative margins and weight growth. HyperSizer Pro simultaneously analyzes and optimizes panel cross-section dimensions, materials, and stacking sequences for all load cases and failure modes. The analysis margins along with traceability details are exported to Word and Excel documents for certification reporting. HyperSizer specializes in detailed stress sizing of over 50 different stiffened panel shapes and sandwich panels. Cross sectional geometry of stiffened panels are simultaneously optimized with the laminates’ ply stacking sequences or metal sheet thicknesses while considering manufacturing constraints. Sizing is based on a broad and deep collection of failure analyses. By combining full-fidelity certification analysis with sizing optimization it is common to see 20% weight reductions maintained throughout the design maturation process going from PDR to CDR to part production. 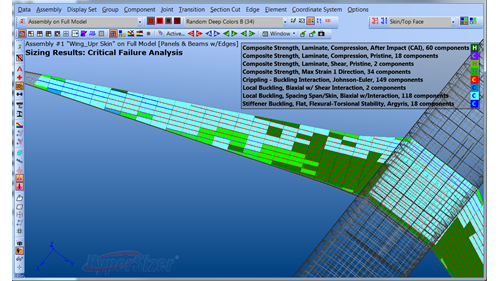 Whether the design is defined with HyperSizer sizing, or imported from spreadsheets of geometry, dimensions and laminates, HyperSizer Pro CAE software specializes in detailed stress analysis of stiffened panels, sandwich panels, bolted joints, and bonded joints using industry-standard methods and finite element modeling techniques. Get the analysis done faster! Process thousands of load cases! Resolve negative margins with automated sizing! The final deliverable for stress analysts is the stress report. HyperSizer generates Word and Excel stress reports with an emphasis on full analysis traceability for FAA certification.